As broadband phone services continue to rise in popularity, regional VoIP providers are finding the means to expand their businesses. Nextiva, a VoIP firm based in Scottsdale, Arizona, expects to hire an additional 100 employees by the end of the year. They specialize in providing VoIP for small and mid-sized businesses, two of the largest growth areas in the industry. Executives from Nextiva were happy to point out that VoIP is being adopted by even the largest companies in the world, including communications corporations such as AT&T, an idea that seemed complete implausible even a couple of years ago. Nextiva has used that growth to post annual revenues well in the millions of dollars, and currently count thousands of users internationally. According to Nextiva CIO Joshua Lesavoy, VoIP can save a business as much as 70% off their standard phone service. And since the service includes fax and text messages on top of traditional voice communication, there should be no limit to the potential growth in the sector. 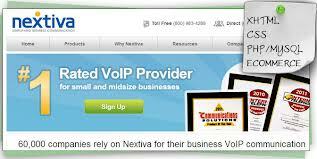 Nextiva was founded in 2006, and launched their VoIP service two years later. They are owned by UnitedWeb Inc., which is also based in Scottsdale, and earns several other technology companies. And while some communications traditionalists still believe that VoIP cannot be relied on, the quality of commercial broadband services now available means a standard that is well in line with if not better than traditional calling. In the past few years, Nextiva has grown from a staff of just a few engineers to more than 165 people, and they even handle their customer service internally with a fully staffed call center. With more than 25 million small businesses currently in existence, chances are this particular small business will grow consistently for years to come.